Christmas is a time for making memories with your family that will last. With our collection of 40+ Fun Kids Craft Ideas for Homemade Christmas Decorations, your home will look festive for the holiday; and, you and your children will have so much fun decorating! You will be able to use all of these ideas for homemade Christmas decorations every year. Many of these Christmas crafts for kids can be done in a classroom as well and taken home to their parents. Below you will find homemade ornaments crafts and decorative crafts for the rest of the house too. Dig out all of your red and green craft materials and start decorating your home with your kids. The little ones will love being involved in the process, and you will be able to keep their Christmas crafts for kids for a long time. 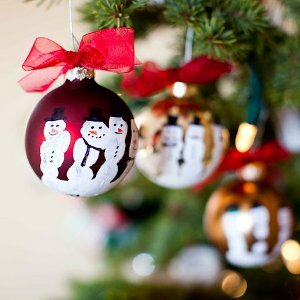 The adorable ornaments and other homemade Christmas decorations will only get cuter as your kids get older. Have fun teaching them Christmas carols and telling them about Santa's magic as your make your home festive! Find everything you need for a DIY Christmas in our collection of 300+ Christmas Crafts and Recipes Kids Love! Christmas is an exciting time for little kids, because they love the magic of the holiday. Keep their excitement and wonder going all through the season with these kids' Christmas craft ideas. There are ideas for homemade Christmas decorations in this list for everyone and everywhere in your house. 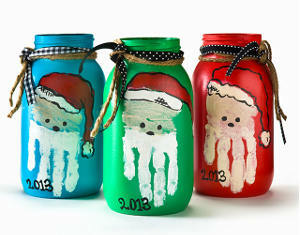 Handprint Art Santa Jars - For little hands! 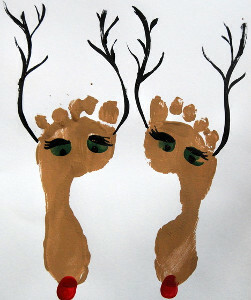 Adorable Thumbprint Snowman Frame - First Christmas cuteness! Christmas revolves around the tree. Whether you chop one down or dig a fake out of the basement, decorating the tree is a fun and special time. You listen to and sing along with classic Christmas carols and tell your children that Santa will put presents under the tree on Christmas Eve. The best holiday crafts for kids are definitely ornaments. They're small and easy to make, and the kids will love seeing them proudly displayed all season. Popsicle Stick Toy Soldier Ornament - Last minute project! Glittery Yarn Christmas Ornaments - Shiny! Find even more Christmas craft ideas for kids in our FREE eBook: Christmas Crafts for Kids: 18 Homemade Christmas Ornaments!